I was very fortunate to be contacted by Eaglemoss Publications in connection with the new magazine about to be launched in South Africa. Baked And Delicious will feature a collection of over 400 recipes, and the publications come with a selection of silicone bakeware to collect. Each issue consists of seven sections and these include celebration cakes; classic cakes; bread and savouries; desserts; patisserie and fancy cakes; biscuits and bakes; and better baking. Over 60 issues have been planned and each one will also include cook’s tips; origins of dishes; final flourish tips; variations; and expert advice. Each subscriber to the magazine will get a storage binder for the copies, which is important to ensure that you can store the magazines without damaging them; 3 storage tins; a cake slice; and an electronic kitchen scale. The last is an essential ‘ingredient’ to successful baking as baking is all about chemistry and ensuring your ingredients are accurately weighed out to ensure they react together properly. If you choose not to subscribe you can purchase the magazine in your local newsagent, and then chose the issues you would like. The silicone bakeware collection will include cupcake cases; brush and spatula; loaf pans; quiche case; heart shaped moulds; cake pans; Madeleine moulds; mini-muffin cases; petit four cases; ring moulds; and icing sets. In the first issue a colourful collection of cupcake cases was included, and I will be testing these with my cupcake recipe and reporting back on how they work. The contents page lists the recipes you will find in the issue, together with a short description. There are 8 recipes in the first issue, as well as a better baking technique and information on how to use silicone bakeware. Each issue will be 26 pages and the magazine will be distributed every two weeks. One cannot judge a good quality magazine on its glossy pages and fantastic photographs alone, so I chose a recipe that did not call for sugar to test. This way, I would be testing the recipe as is, without substitutions. 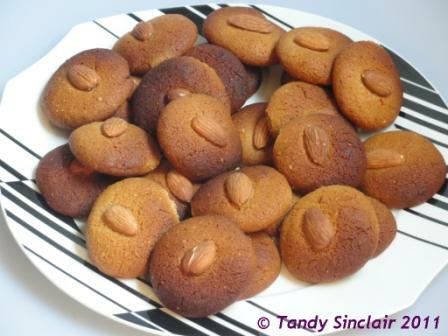 I chose the Lebkuchen (page 18). I halved the recipe as I did not have enough honey to make a complete batch. The list of ingredients is concise but I would have swapped the steps in stage 1 around so that the butter and honey would be melted completely by the time I had finished measuring the dry ingredients. I do not like measuring honey in liquid measure as you can never get the honey out of the measuring container without oiling it first. I much prefer to weigh honey and so I can share with you that 100mls of honey equals 155g. The recipe did not tell me how long to leave the mixture to solidify but I went to watch a recording of Top Chef and that is about 40 minutes of viewing. I must say, I was quite skeptical about the mixture firming up and half expected to have a gloopy dough, but it firmed up properly and I could roll the biscuits out without any extra flour. I used my silpat instead of parchment paper for the baking. After 15 minutes my biscuits were nice and golden and I took them out of the oven to cool. They were soft as I lifted them off the silpat onto my wire cooling rack, but by the time they had cooled they were nice and firm. The biscuits are lovely and crunchy and the spices come through well. If the proof of the pudding is in the eating, then I can recommend that you subscribe today. Recipes that work are what will make this publication a huge success. Disclosure – even though I received the magazine free of charge, I was not asked to write a favourable review, nor did I receive payment for this review. This post is in line with my blogging policy. 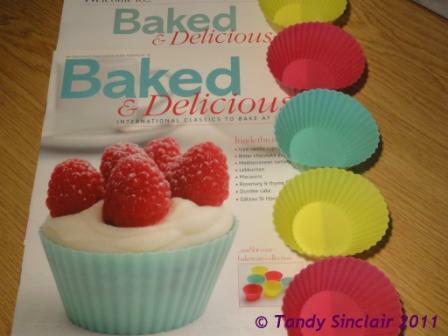 Tandy, thank you for the nice review and testing 🙂 I love baking magazines…this sure looks a lot of fun! What a fun idea – I am still a bit sceptical about silicone bake ware – just seems strange putting “plastic” into the oven. Hope your birthday has been special. it is if you subscribe! Great stuff! Took it up for the free stuff and hopefully I will start baking since I have little ones to spoil. thanks for the birthday wishes 🙂 I am sure the little one will enjoy being spoiled!